How many times in the course of a day do you roll your shoulders and neck around to alleviate “the spot” in between your shoulder blades. There are several reasons for the discomfort you are experiencing, but one way to resolve this is to do what is known as a “chin tuck”. Sure, your co-workers may give you some funny glances, but the joke will be on them when you are the one without neck pain. Research has shown that every inch of forward head posture, results in an additional 10 lbs. of weight pulling on your posterior (back) neck muscles. The same muscles that run down your spine as well as attach to the shoulder blade. By doing this simple movement/stretch every hour or so of screen time, you will see a significant reduction in your overall discomfort in just a matter of a week. The best way to do this movement at first, is in front of a mirror. This way you will be able to see that you are being strict with the motion. This is an essential component of this hack. With your ears lined up over your shoulders, take both hands and place your finger tips on your chin. 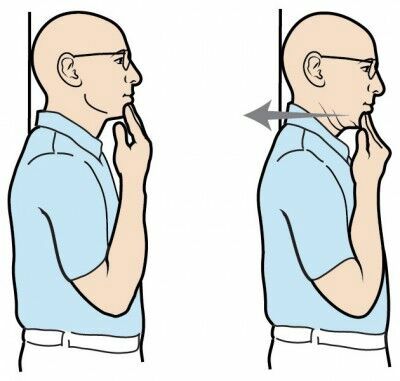 Press you fingers into your chin and feel the glide of your head go slightly back. The motion is small, but you should feel an immediate response at the base of your skull, known as your occiput. Once you have applied the motion, release and proceed to protrude your jaw forward and repeat the steps again (5-10 times) by pushing your fingers into your chin. Try this one and let us know how it felt.